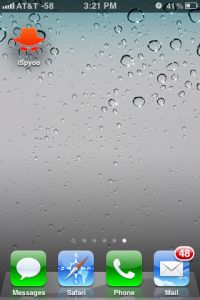 iSpyoo Spy iPhone is the leading spy software for the iPhone, आईप्याड and iPod. पाठ सन्देशहरू अनुगमन गर्न चाहन्छ जो लागि, पूरा चुपके मा आफ्नो एप्पल आईफोन को जानकारी र जीपीएस स्थानहरू कल, यो सफ्टवेयर काम गर्छ. फोन डाटा योजना हुनुपर्छ & an Internet connection so the iSpyoo software can upload logs to your account. iSpyoo Spy iPhone is the world’s first and best iPhone spy software! At iSpyoo, we want to make sure you are getting top-notch service. If you have any kind of problems during installation, feel free to contact our customer support reps who are happy to help you any time. Click हामीलाई सम्पर्क गर्नुहोस and the click Contact Form to give us your requests. Many thanks.